So it's nearly June already! Where did the time go? 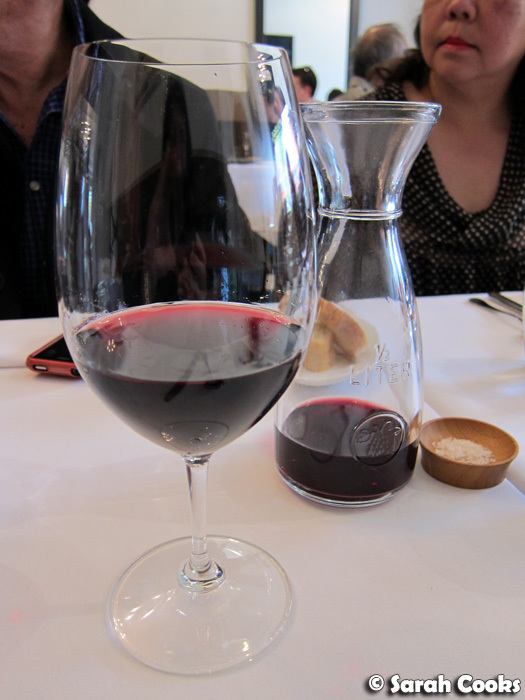 In addition to the yogurt party, lunch at Embrasse, and our fab weekend away in the Yarra Valley, there was all of this! 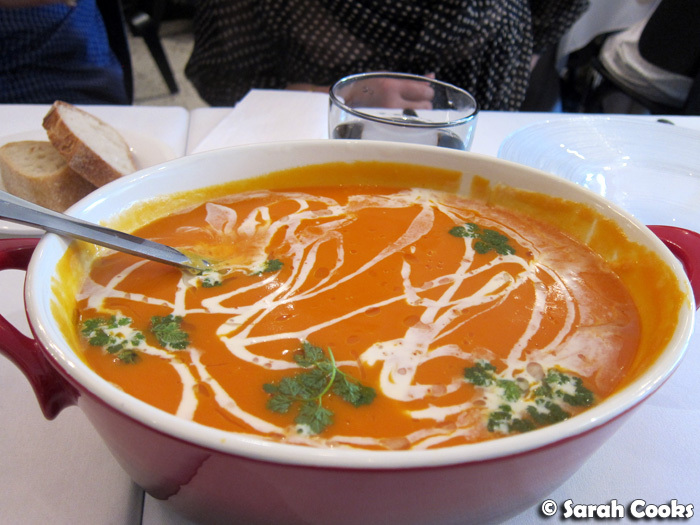 At the start of the month, I had a lovely lunch with my parents at Cafe Vue Heide. 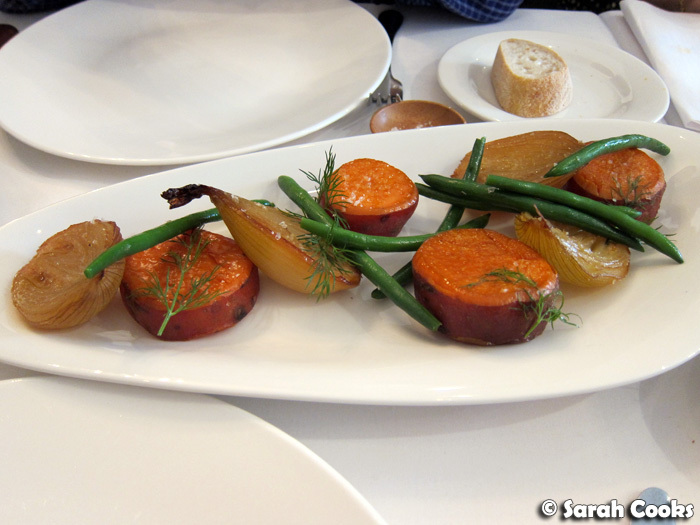 We had the two-course menu du jour (two courses for $35, three courses for $45). 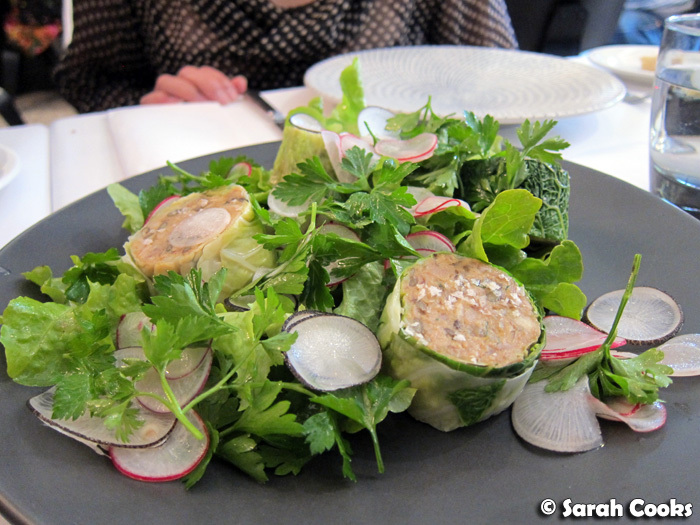 I particularly liked the Heide garden salad with spanner crab (top left in the picture below), but the mains were no slouch. 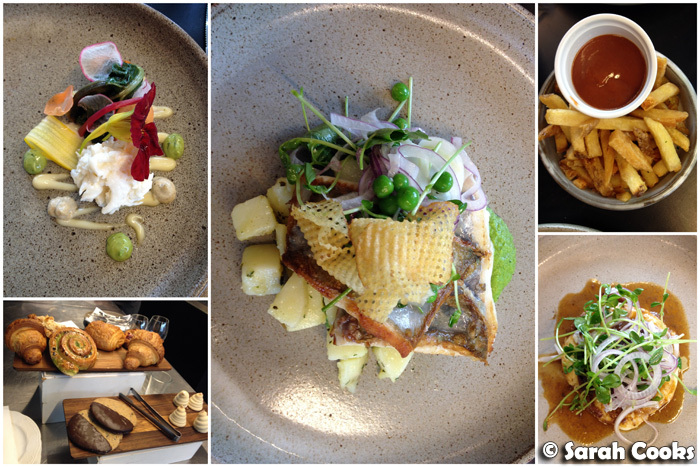 The grilled Mark Eather Fish of the Day with Heide Garden roasted potatoes (centre) came with cute little waffle chips on top, and the David Blackmore braised beef with ginger and coconut on pomme mousseline (bottom right) was a decadent plate of slow-cooked, tender beefy goodness. 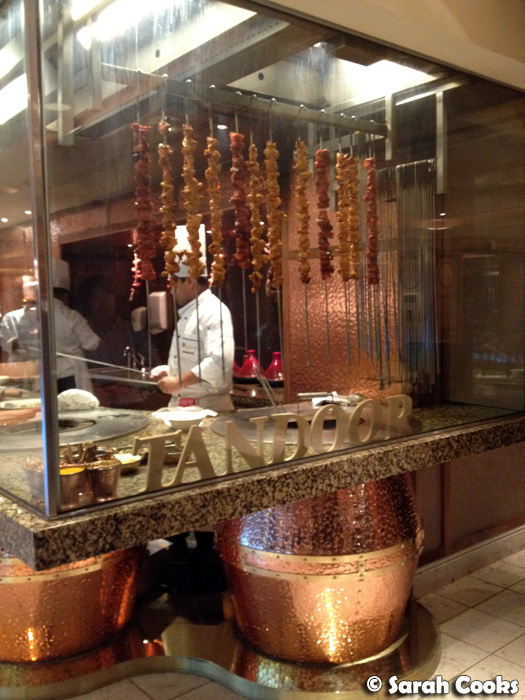 To be safe, we'd booked a table, but this meant we were locked into the menu du jour. Whilst we definitely enjoyed our lunch, I must admit that we were looking enviously at the big sandwiches, burgers and wraps being served to other guests. Apparently if you just rock up you can order from the normal cafe menu - we'll be trying this next time! Sandra and I had a weekend away in the Mornington Peninsula, visiting restaurants, markets, and food producers in the region. (Disclosure: this was a complimentary media trip to promote the region). 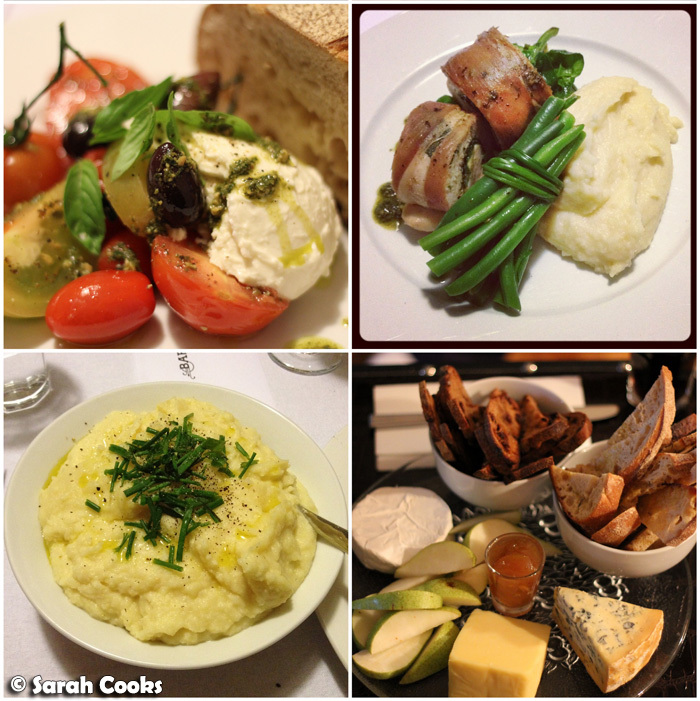 It was two days chock-full of fabulous food! 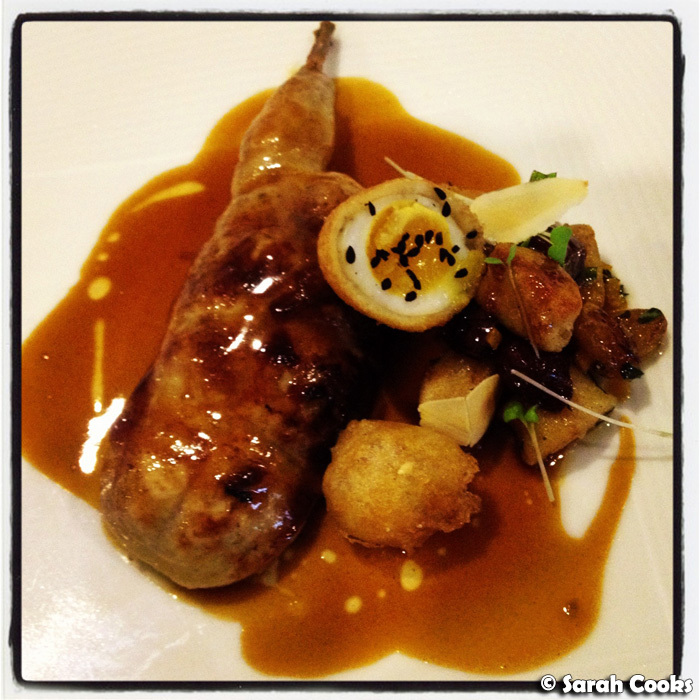 Posts from this trip are coming up soon, but for now I'd like to show you one of my favourite dishes from the weekend: stuffed quail leg with, cinnamon gnocchi, dried grape juice and a deep-fried quail egg, at the Terminus Restaurant in the Flinders Hotel. Yum! 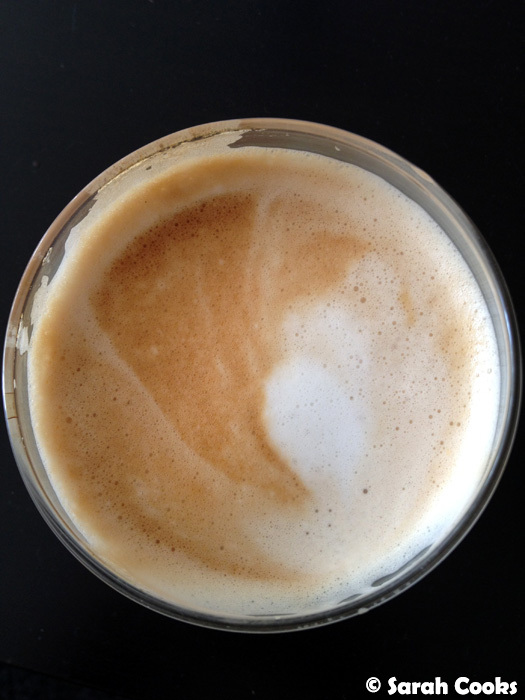 We got a Nespresso Machine this month. (I bought it as an early birthday present for Sandra, after she tried the machine at the Mornington Peninsula accommodation and really liked it!) At first, I wasn't too convinced of the need for it, but now that we've had it for a few weeks, I love it! 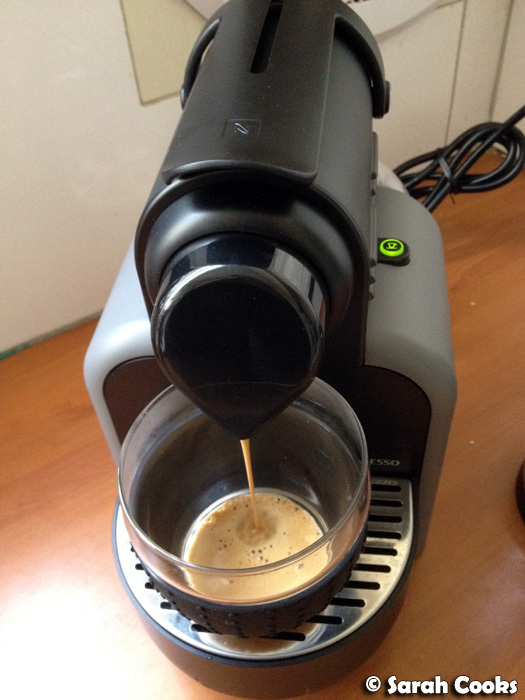 The coffee tastes good, it's so easy to use and it's pretty much impossible to stuff it up. (So important for home coffee makers, I think). This does mean, though, that with the new Nespresso machine, our existing coffee appliances, and a very generous joint birthday gift that some good friends gave us last week, we now have FIVE different coffee makers at home. FIVE! (Six if you count the KitchenAid espresso machine at my parents' house). And I rarely drink more than one a day, hehe. 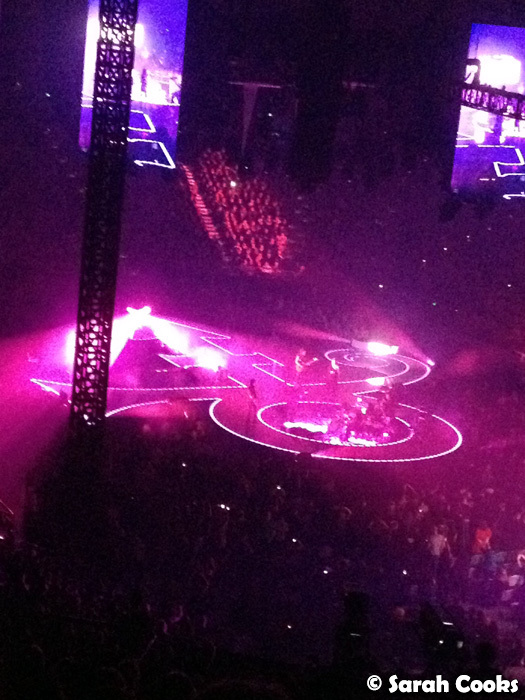 Mid-month we went to see Prince in concert (squeeeeeeeeeee!). Needless to say, he was brilliant! He sang Mountains! And I was just amazed that a fifty-three year old man could dance for three hours in high-heeled boots. So amazing. Prior to the concert we needed sustenance, which came in the form of dumplings and spring onion pancakes, at Dumpling World (608 Collins Street). 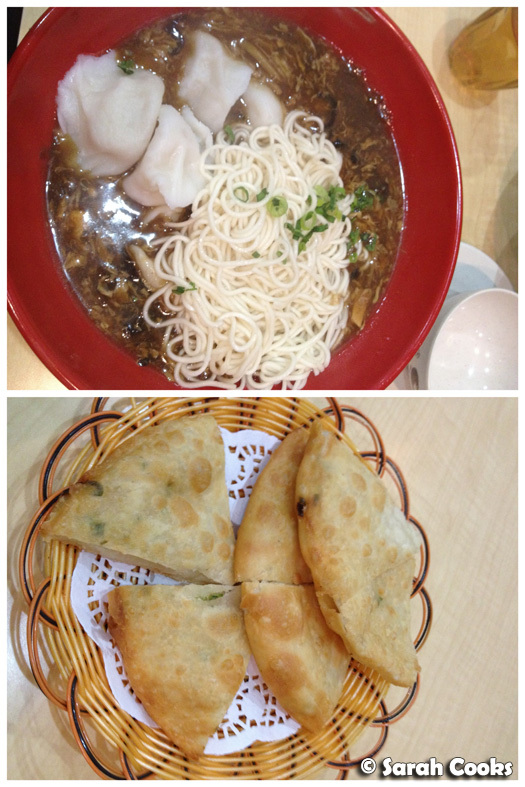 They were pretty good, and the busy restaurant is a welcome addition to this otherwise pretty lacklustre part of town. 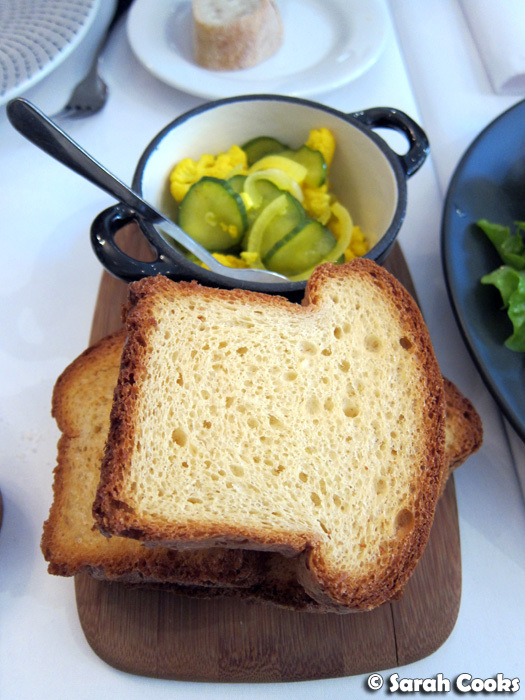 Another noteworthy eat was South of Johnston, on Oxford street in Collingwood. 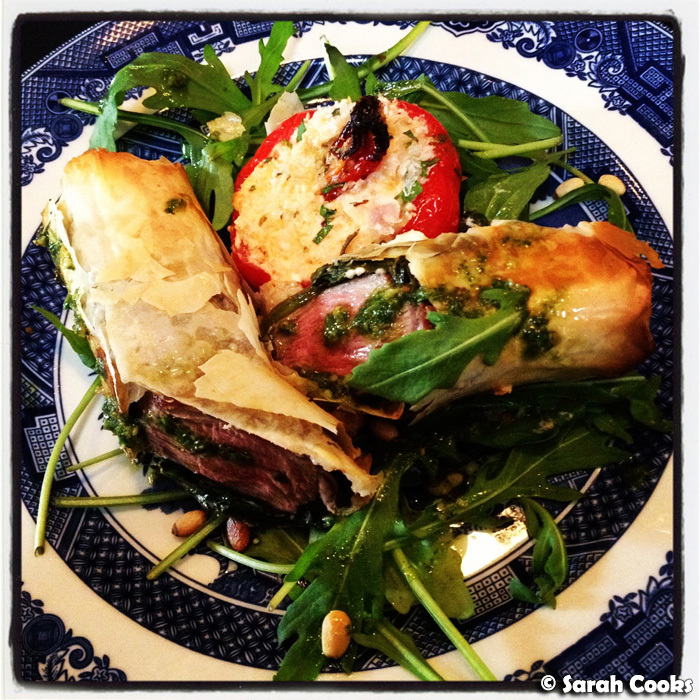 I caught up with my friend Kristine here for a midweek lunch - the coffee was good, and I thoroughly enjoyed my lunch of lamb wrapped in filo with pesto, served with a stuffed capsicum. Due to the dire parking situation on Oxford street (and our almost complete lack of coinage), we moved down the street to Proud Mary for our second course (heh) and to continue chatting. 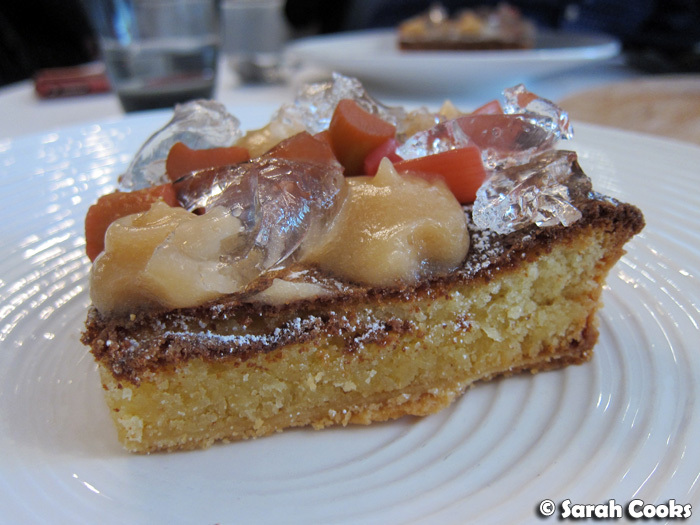 (You can read about my previous visit to Proud Mary here). Obviously the coffee there is excellent, but my favourite thing here is the carrot cake. It's moist, with nice pieces of sultanas and walnuts inside, and a generous splodge of cream cheese icing on top. 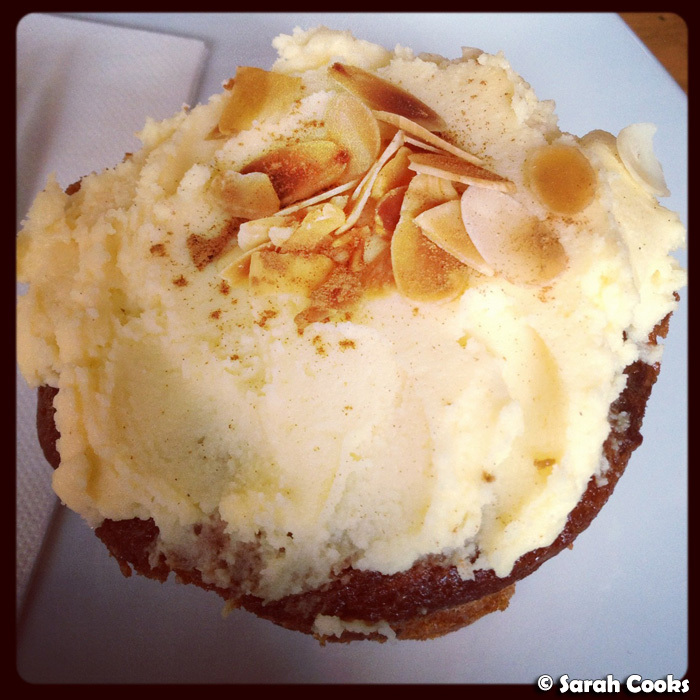 It's fantastic, and I happily visit Proud Mary just for their carrot cake! 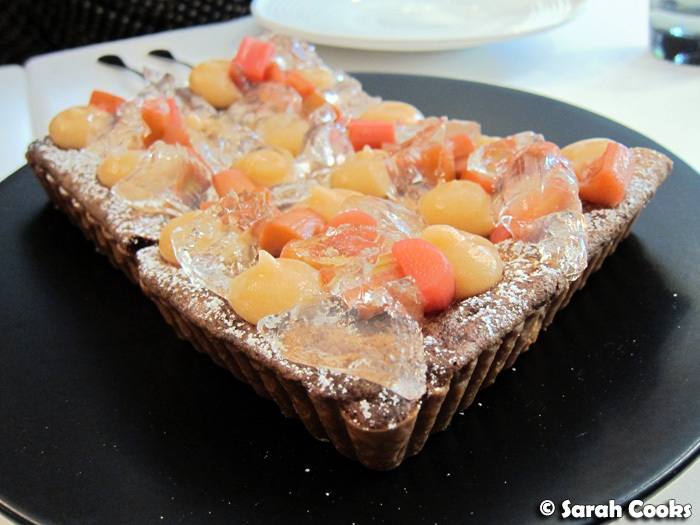 It's on the pricey side, at $5.50 for a jumbo muffin-sized cake, but it's so good! 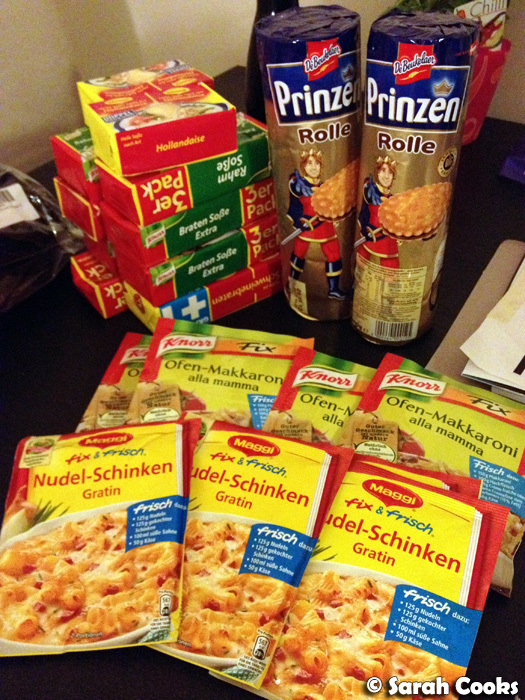 We received another German Care Package from Sandra's folks in Germany. I'm personally a bit indifferent to the gravy and hollandaise mixes, but I can unreservedly declare my love for those delicious Prinzen Rolle biscuits. They're the Oreo of Germany, but much tastier! 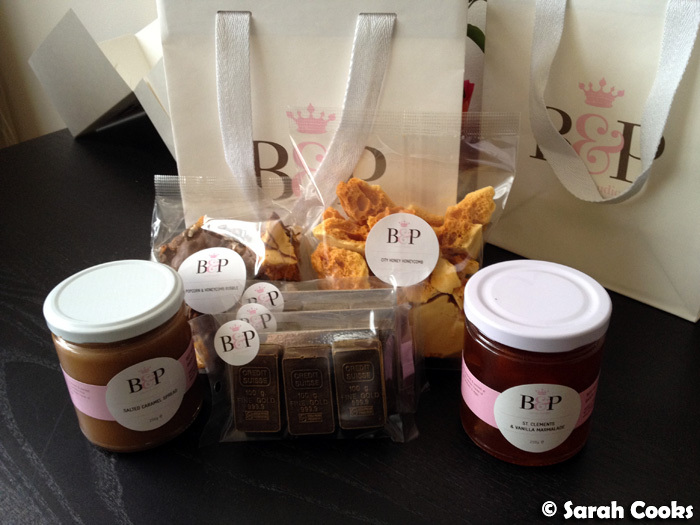 I made a little expedition to Burch and Purchese with my parents just last week - my Dad loved it, and we ended up spending $83 in the one go! Eep. This column of deliciousness, below, is called explosive milk chocolate and raspberry, and it was fabulous! 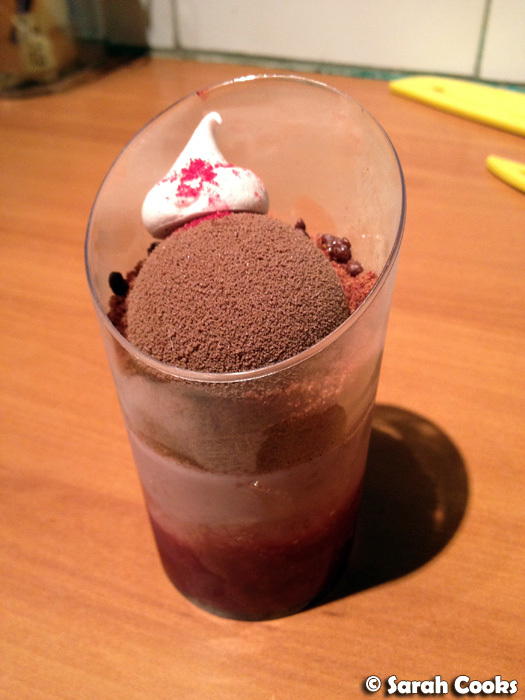 It contains: milk choc and raspberry mousse / exaggerated (???) raspberry cream / milk choc Sacher sponge / fresh raspberry compote / chocolate royal biscuit / raspberry marshmallow /chocolate coated pop rocks /mirror chocolate glaze. Woah! 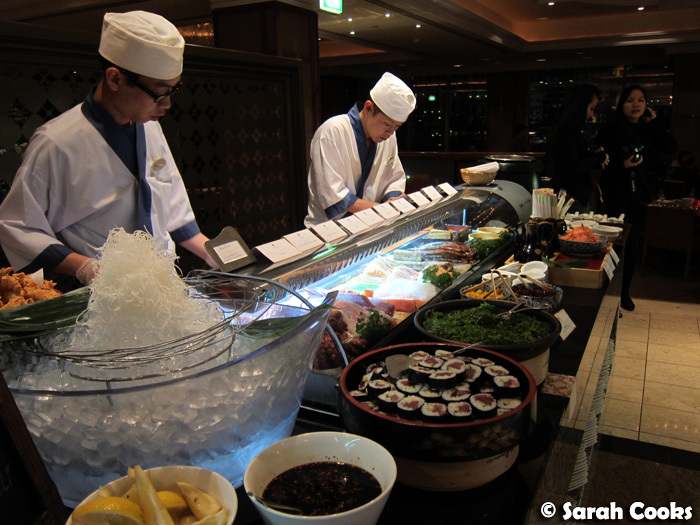 On Tuesday night this week, I was invited to The Langham Hotel (with a few - other - bloggers), to try out the buffet at Melba restaurant. 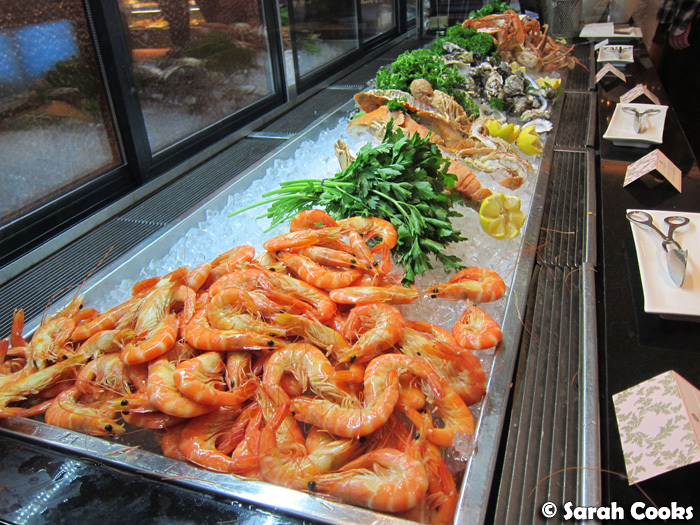 I'm a big fan of buffets from way back (I am Malaysian, after all), and I thought this was a great one! 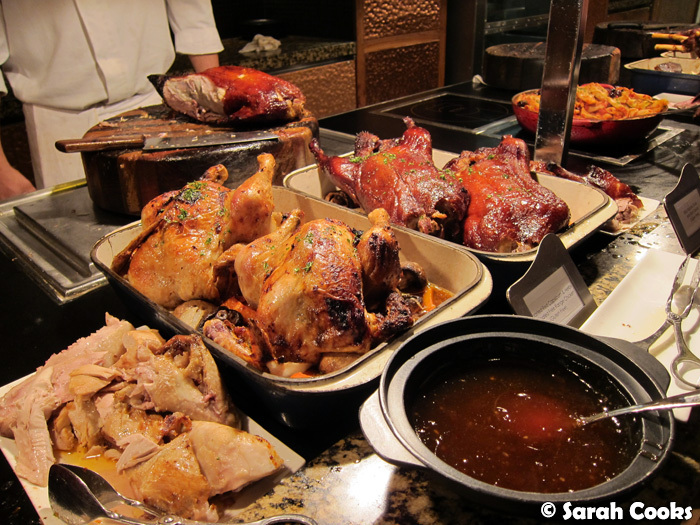 I was very impressed by the quality of the roast duck, which was super juicy, crispy and meaty - fabulous! 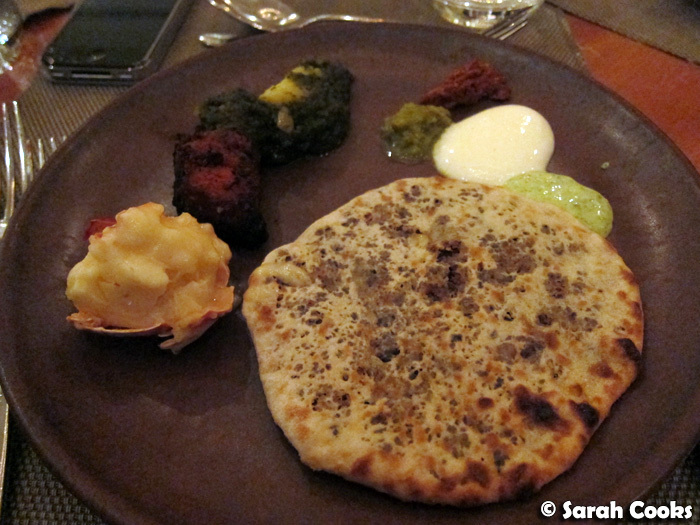 Also excellent were the fabulous naan breads, cooked fresh to order. It seems that plain, garlic, or cheese & garlic are the most popular flavours, but they make quite a range of naans (including fun ones like M&M's). They didn't have my favourite, kashmiri naan (filled with nuts and raisins), but offered to make me a peshwari naan - filled with dried fruits and coconut and generously slathered in ghee. It was amazing! 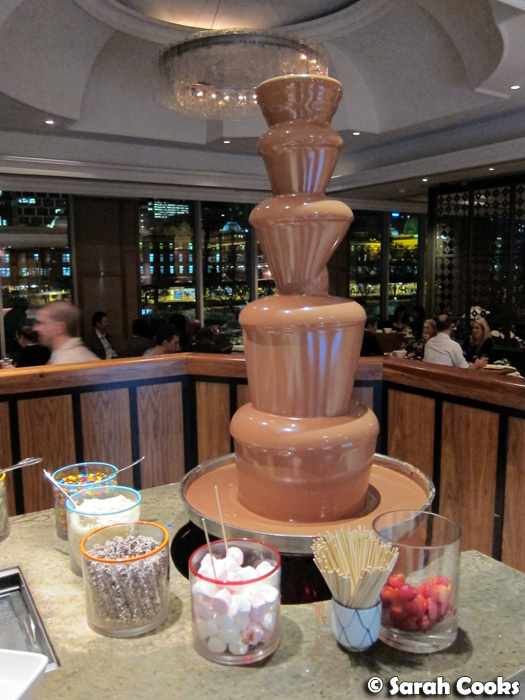 And of course, no hotel buffet is complete without a chocolate fountain! 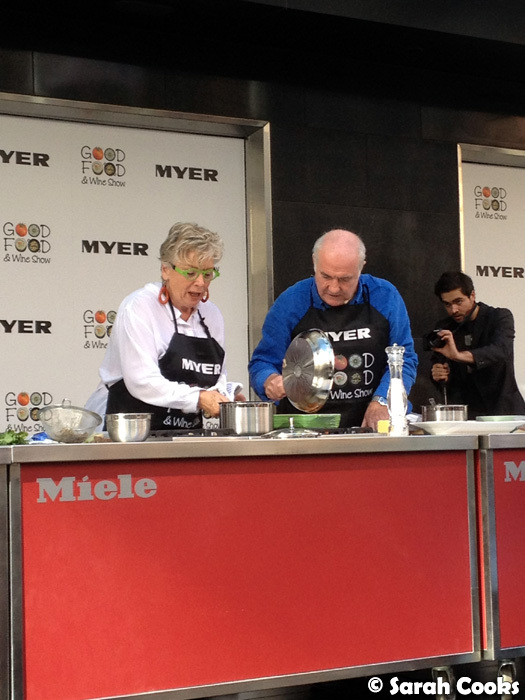 Today I stopped by the launch of the Good Food and Wine Show, held at Myer Bourke Street Mall. Luckily the weather held out - how lovely was it today? 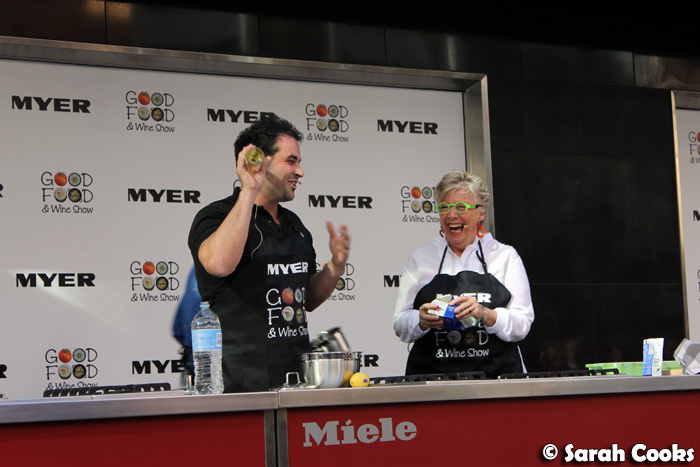 Celebrity chefs Maggie Beer, Rick Stein, John Torode, Manu Fieldel, Miguel Maestre and Adrian Richardson participated in a cook off on the temporary stage, judged by Giaan Rooney and James Tomkins. It was actually a lot of fun - lots of big personalities on that stage! Check out this hilarious pic I got of Manu Fieldel - he just jumped right up onto the bench to give some tickets to a (slightly terrified) little girl in the audience. Bless! 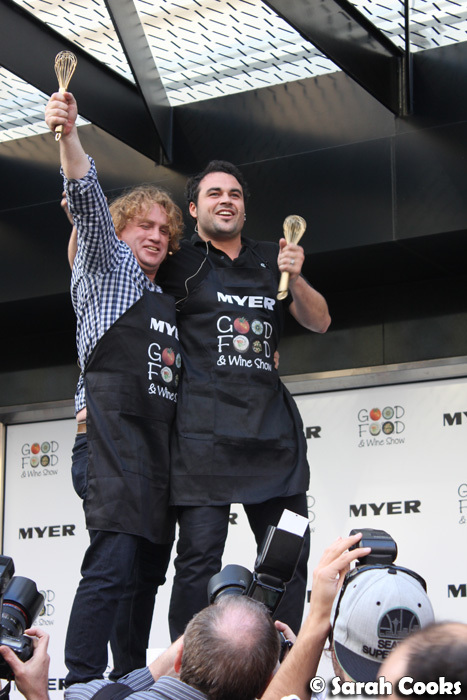 And here are the happy winners of the cook-off: Adrian Richardson and Miguel! They sure look happy with their golden whisks! 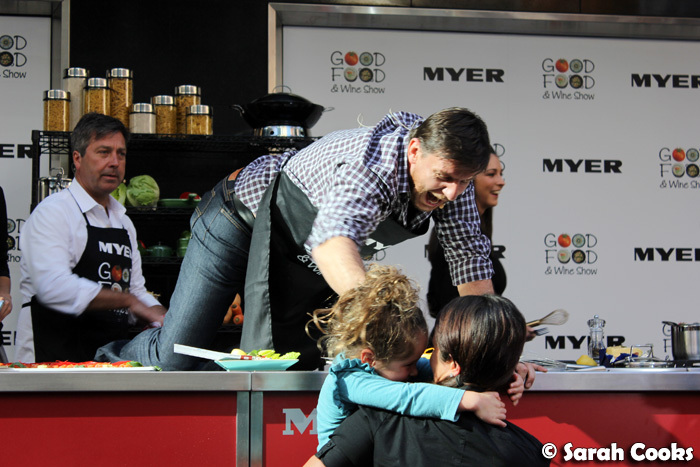 I'm off to the Good Food & Wine Show this weekend. I've never been before - any tips or suggestions to get the most out of it? Blogger Joyce from Mel: Hot or Not suggests stretchy pants, taking a Nanna-trolley and taking public transport. Check, check and check! And that was May! Phew! I know I say this every month, but I'm sure June will be a quieter month. (I hope!) I literally have no social engagements planned and am trying to keep my calendar as clear as possible... but I guess we'll see how long that lasts! Hey hey! How was everyone's weekends? We had a great one! 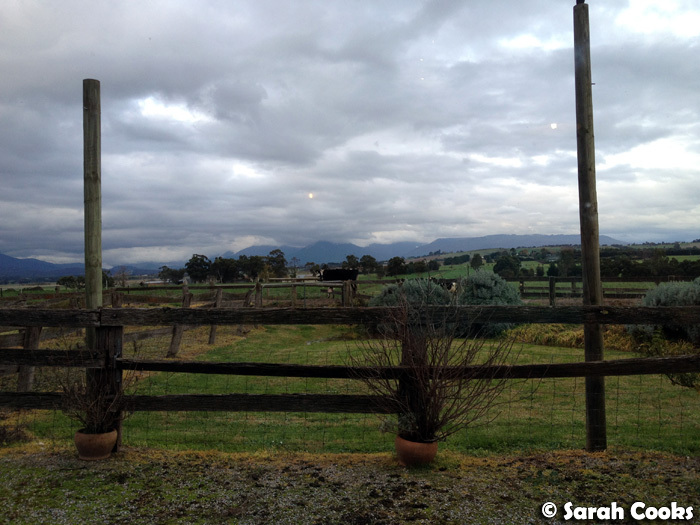 We had a weekend away in the Yarra Valley, where we spent a lovely two nights with a group of friends celebrating Sandra's birthday. YAY! You may remember that earlier this year, I was lucky enough to be invited on an all-expenses-paid trip to the Yarra Valley, hosted by Yarra Ranges Regional Marketing. Whilst we had a great time visiting different cider and beer breweries, and enjoyed some great restaurants, the highlight of the trip was definitely the gorgeous accommodation, Barolo Lodge. I absolutely loved the it, and after we came home I blabbed on about it endlessly to all our friends: "Guys, there's a hot tub! ", "There was a private chef! ", "He made this incredible cheddar cheese mash!" I was so pleased that we were able to organise another trip there last weekend, on our own coin, to share the experience with seven of our friends! Unlike my other recent weekends away, this one was more about relaxation and chilling out, rather than busily trying to see a whole bunch of different sites. Although we did make a couple of little expeditions the next day, this weekend was all about the hot tub and Eurovision! 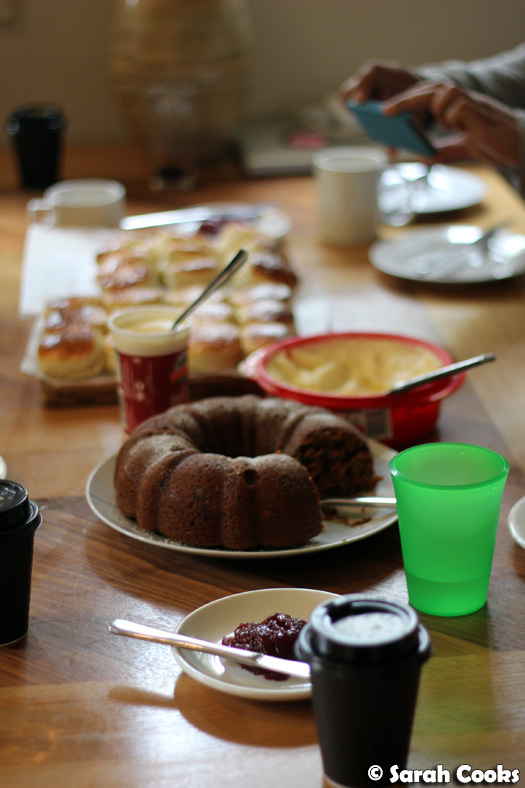 All nine of us who went on the trip are big food lovers, (which I'm sure will come as a huge shock), so I did some baking beforehand, and even brought up ingredients and utensils so I could make breakfast. 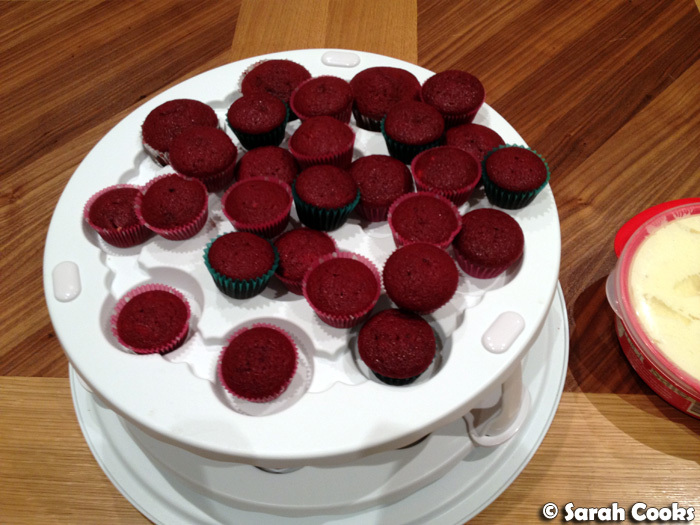 I made a big batch of red velvet cupcakes to share, baking them at home and icing them at the cabin. 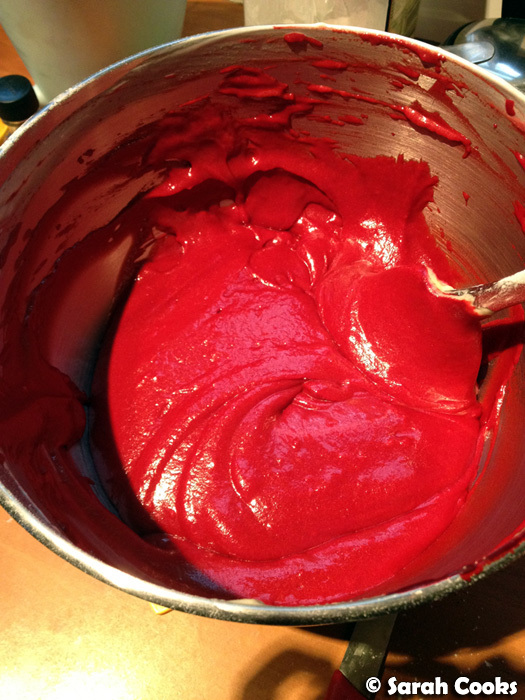 I love how bright red the batter is, just like thick ketchup! 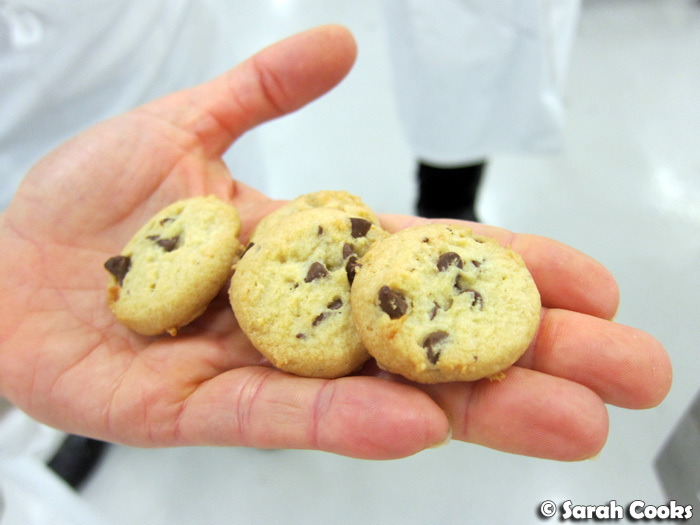 Here they are, all baked and ready! 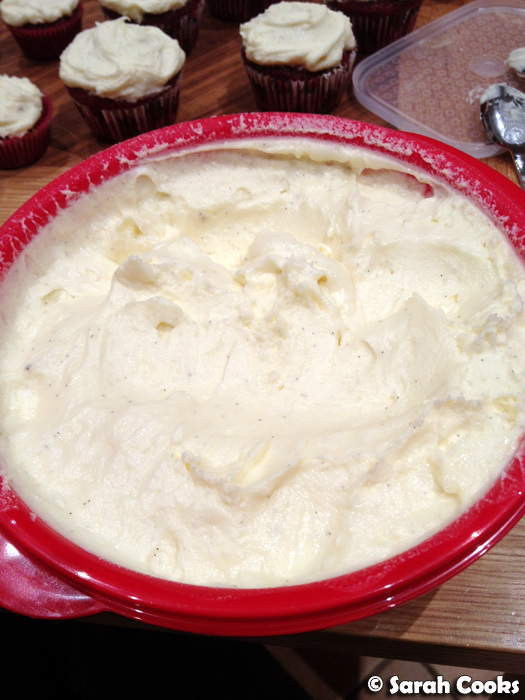 Rather than the flour-based icing I used the first time, I made a vanilla-bean cream cheese icing. (It's this recipe, from Allrecipes, replacing the vanilla extract with the beans from a vanilla pod). The comments on the recipe said it was much less sweet than store-bought American cream cheese icing, and that you can really taste the cream cheese - perfect for me! It was so yum! 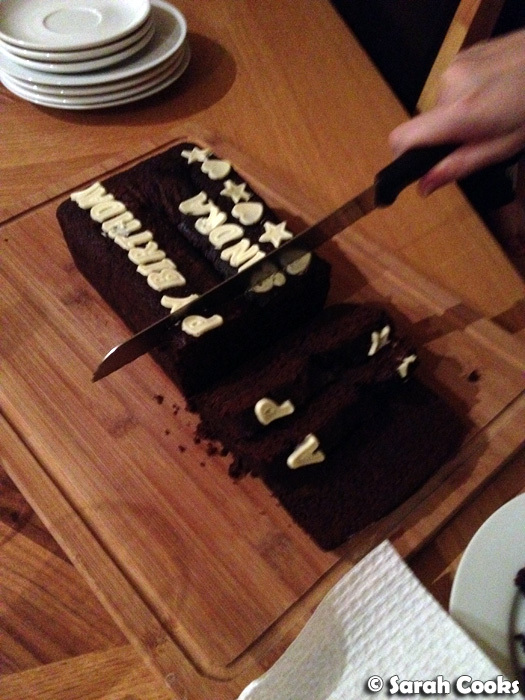 And just quietly, I think people prefer the icing to the cake itself! I slightly (ok, vastly) overestimated the amount of icing I'd need, oops! But we didn't have any problem finding other things to eat it with! Due to varying work schedules, people were arriving at different times on the Friday night (including our one beloved Canberran who flew in for the occasion and got there at around 10:30! 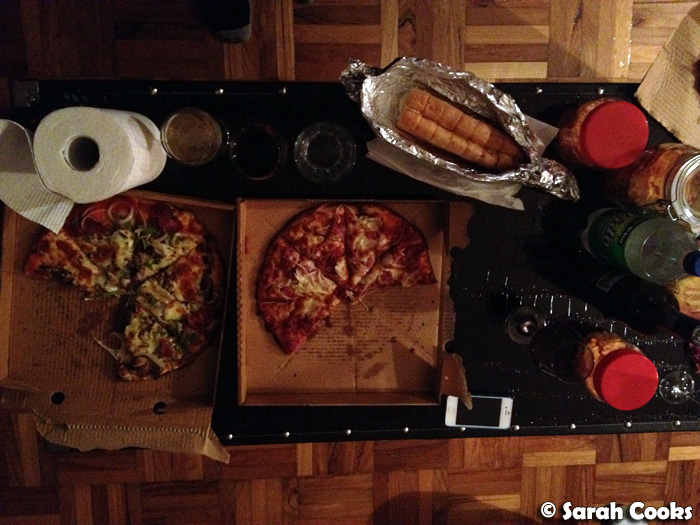 ), so rather than organising anything special, we just ordered in pizza from around the corner. We had a big breakfast the next morning: I baked scones, and my friend Alaina brought her amazing chocolate chip pumpkin bread. You'll notice the takeaway coffees in the above photo - we sent the boys on a coffee run to Essenza, the lovely cafe owned by the same owners of Barolo Lodge! Dee-licious pumpkin bread. 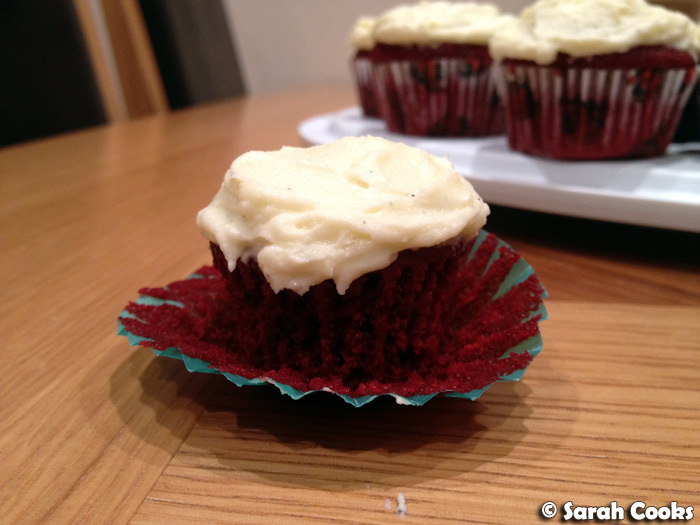 This was something that goes very, very well with cream cheese icing! 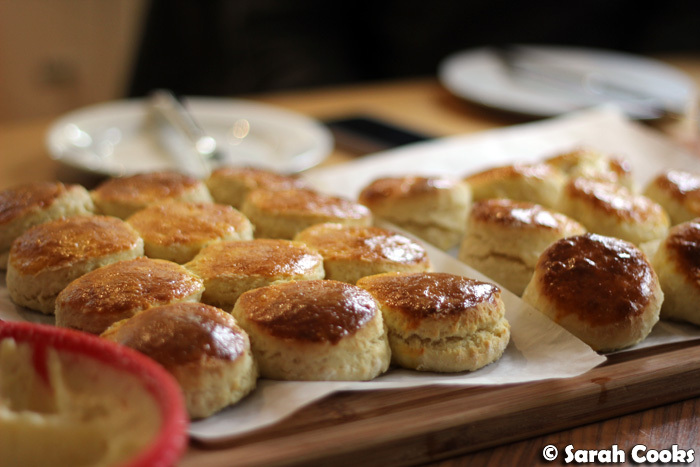 And here are my scones! 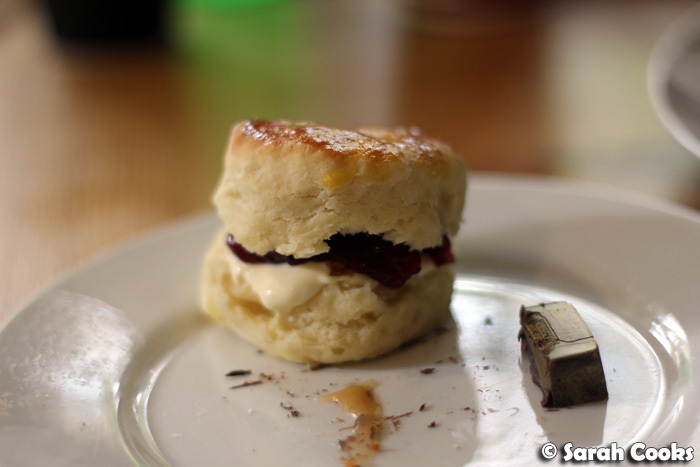 After many, many different attempts, I've finally cracked what I think is the perfect scone, by mixing up a few recipes and tips from different sources. I'll be sharing the recipe with you all soon! 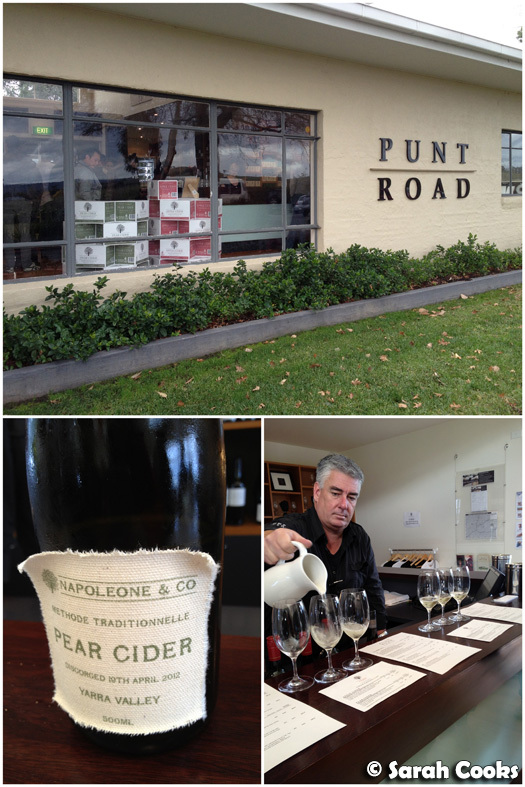 So, I did say we made a couple of little excursions - one was to visit Napoleone & Co Cider / Punt Road Wines for a tasting. (You can read about my previous visit here, and their "Garden of Eden" pork spit roast lunch here). I'd been in Twitter communications with Napoleone & Co the week before, and they kindly held back a bottle of their methode traditionnelle pear cider for us to taste. This is my favourite of all their ciders, and won't be available for the next couple of weeks - boo! But we made do by buying some wines and a few bottles of their normal pear cider. 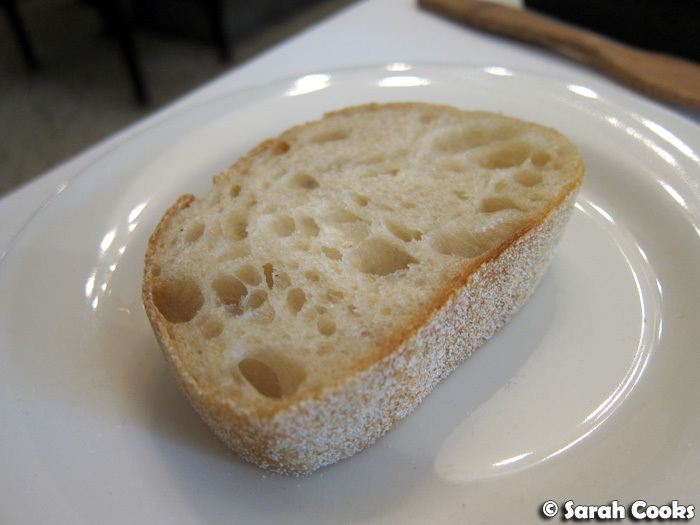 While we were there, I had a chat with one of the ladies who works at the Cellar Door, and she happens to read my blog, and has done so for ages, since the Sarah Discovers How to Eat days. (Wow, I didn't think anyone even remembered that any more!) Hi Dani! It was really nice to meet you! 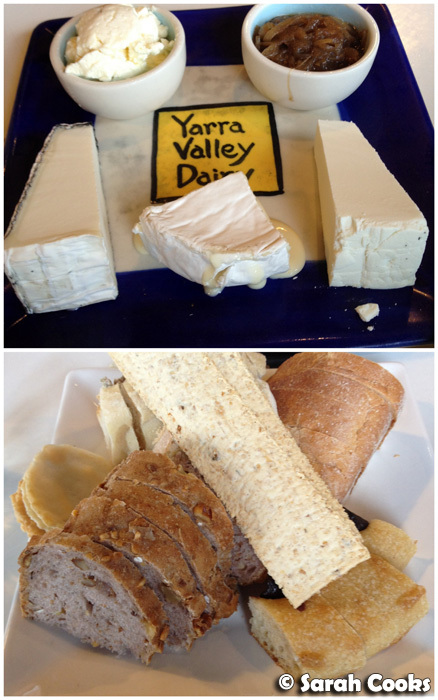 We then went to the Yarra Valley Dairy, for a bite to eat. 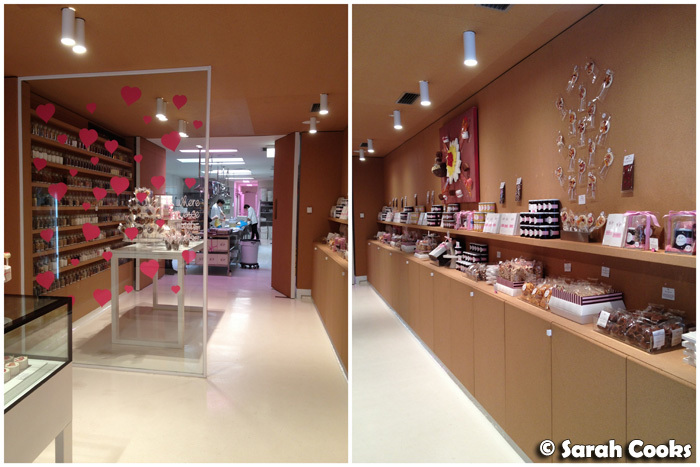 (You can read about my previous visit, here). The $27 cheese platters are very generous, and sharing three platters between nine of us was definitely enough for a light lunch. I love their marinated feta and the goats pyramid! I thought the views from our table over the dairy were rather beautiful too. Dinner that night was at the accommodation too - we decided to splash out on the personal chef experience. 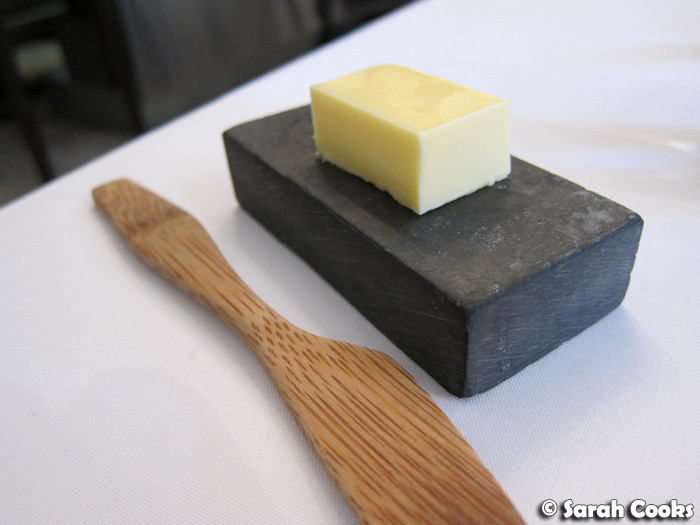 (I say "splash out", but at $60 a head for two courses and cheese, I think it's very well priced!) Owners David and Gianpaolo arrived about an hour before dinner to cook, to light the fireplace and to set the table. 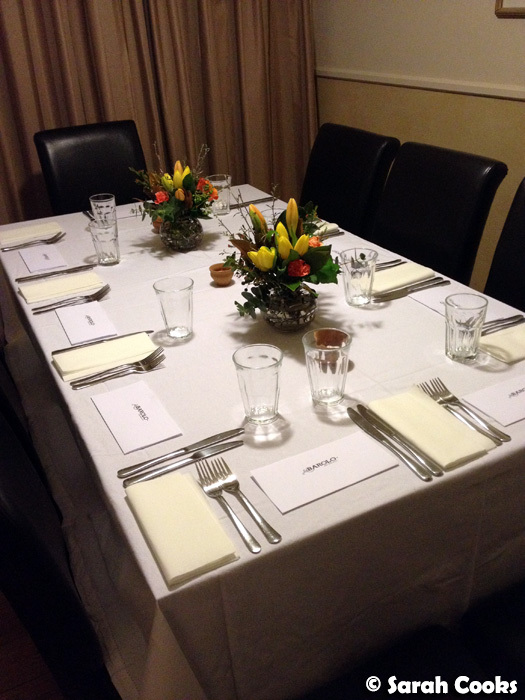 How pretty does the table look! 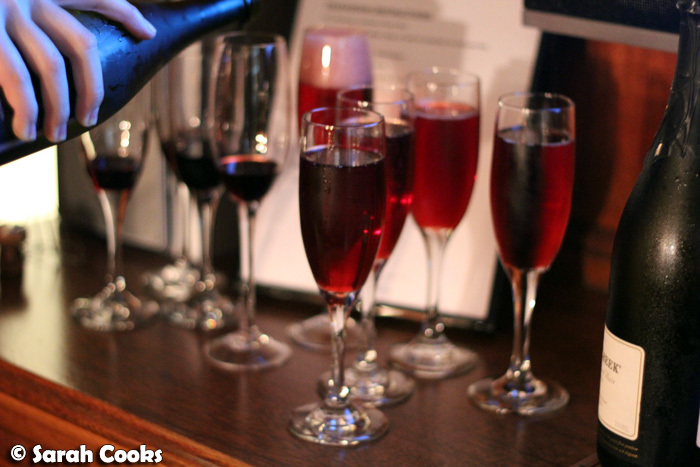 I poured some kir royales to get started, and then it was time to eat! 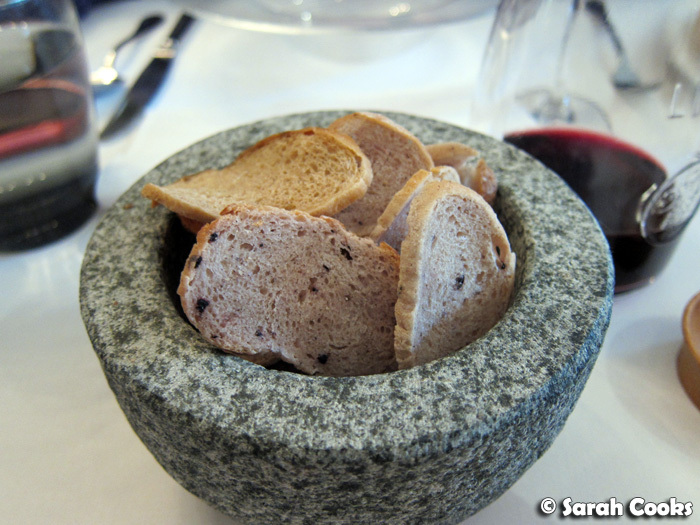 You'll see that the menu was the same as last time, which was a good thing - I actually requested the same dishes because we enjoyed them so much! I felt like there was something for all of us here - we all loved the fior di latte, and they were really generous with it (swoon! 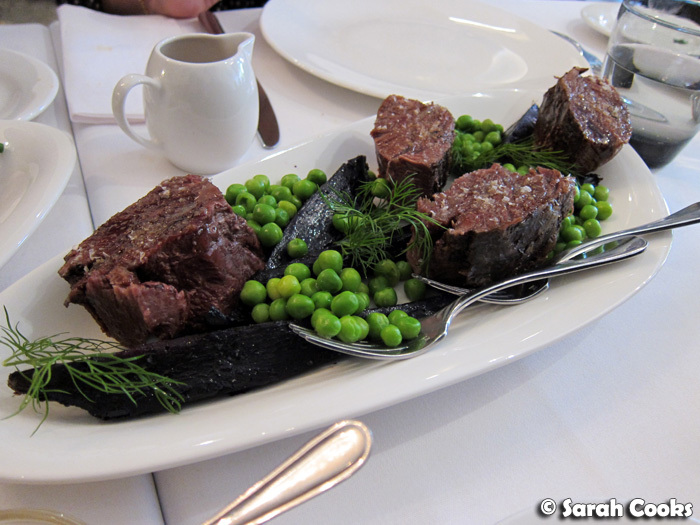 ), my friend Kristine loves meat-wrapped-in-meat (her words, not mine! 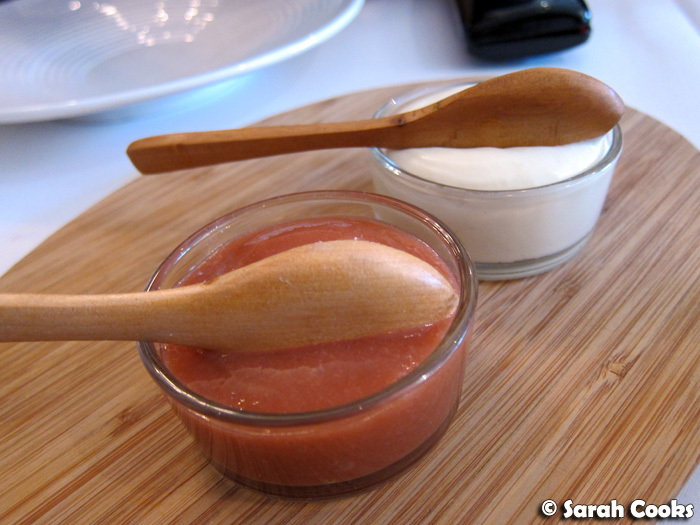 ), and we had a couple of non-olive eaters who donated their olives to the olive lovers on the table. Win win! One of our friends who doesn't generally like tomatoes, really liked the sweet roasted cherry tomatoes on the vine! Sandra had been eyeing the plates to see who'd gotten the biggest portion of cheddar cheese mash, and we all had a giggle (and gave a little round of applause) when Chef Gianpaolo came out and surprised us with an extra bowl of cheddar cheese mash just for her. Cheesy carby goodness for the win! Needless to say, we were all stuffed after that massive meal - thank goodness we didn't have far to go! It was many hours later - hours filled with Eurovision, hot tubs, wine, cider and charades - that we could even attempt to eat the birthday cake. Nigella's dense chocolate loaf cake, from How to be a Domestic Goddess, is a plain-looking cake, and ordinarily on a special occasion I'd go for something a bit fancier, with layers and icing, but it's Sandra's favourite. It's actually perfect for travelling, because it's easy to make, and it improves over time, so you can make it a good few days in advance. I think it's actually my most often-baked Nigella chocolate cake! (And that says a lot, hehe). 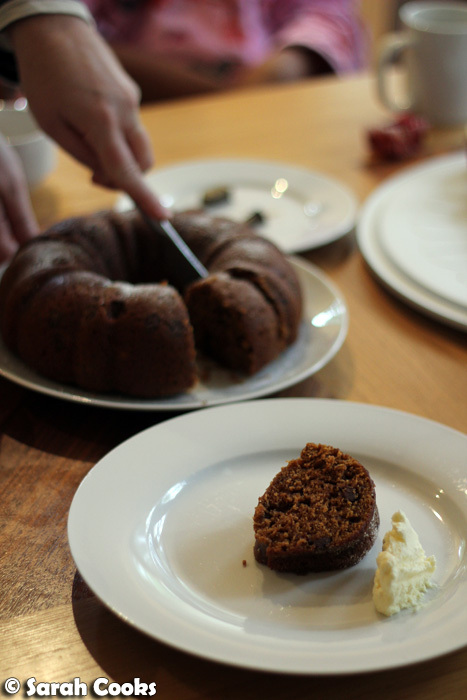 Being damp and sticky like gingerbread, we found that it goes beautifully with cream cheese icing! 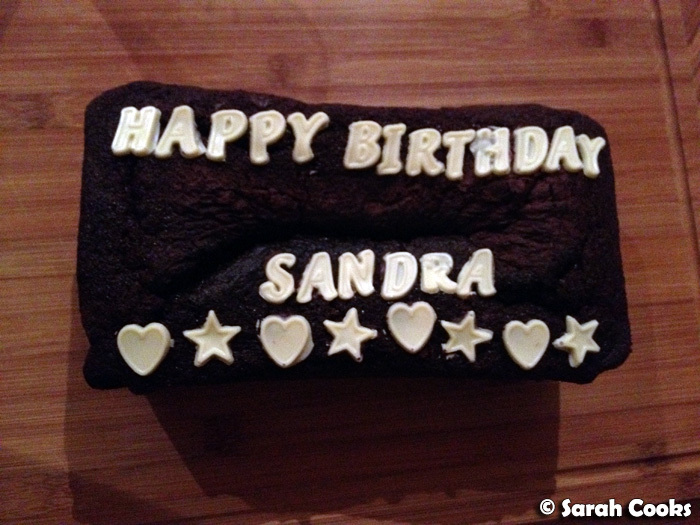 Happy Birthday Sandra! 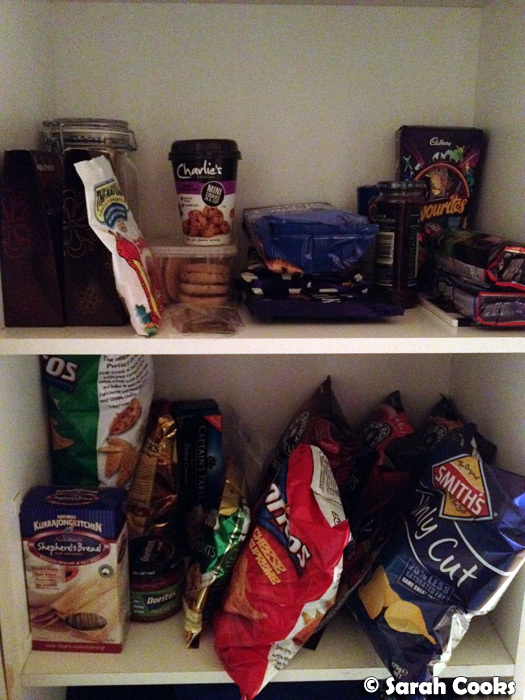 And a big thank-you to all of our friends for joining in the fun, for being generous with their time (and snacks! 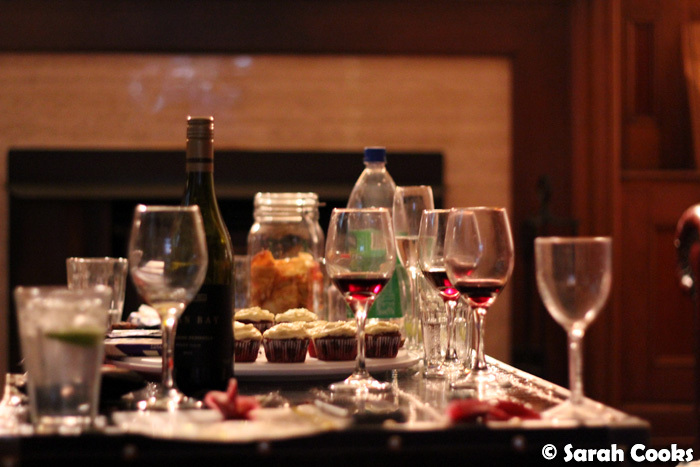 ), and for helping to do the rounds and rounds of dishes we managed to accumulate. It was such fun! What are your favourite destinations for weekends away with friends?